Located in the south-east corner of the Queen Elizabeth II Wildlands Provincial Park, Ontario, Canada, Crooked Lake is little more than 50 miles north of the city of Peterborough. 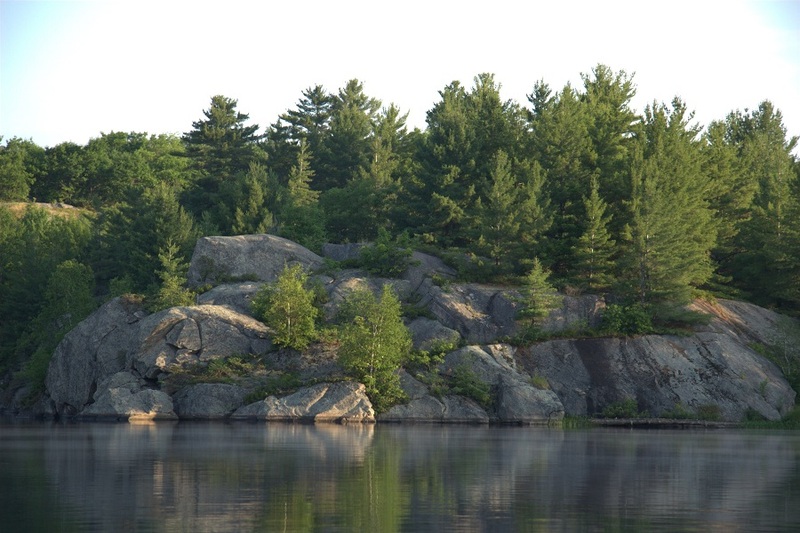 Yet it is as pristine and untouched as the lakes of the Canadian Shield far to the north. There are roads along the eastern and southern edges of the park, but none within it or along its northern or western boundaries. Consequently, access the interior is limited to float plane or boat and portage. This means that only a few lakes near the roads on the eastern and southern boundaries have any kind of public access, and that those in the interior are accessible only to those with the fortitude for arduous paddle and portage expeditions, or with the wherewithal to employ a float plane. 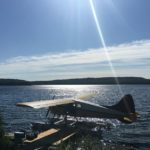 We watched the Cesna, packed with all our gear, lift from the unruffled surface of Balsam Lake, climb to the north, and dwindle into the hot, hazy distance, heading for Crooked Lake. “He’ll be there in 15 minutes,” observed Kerstin as we turned away from the dock and headed for her truck. It took us over two hours by road and three lake traverses with connecting portages to make the same journey. Crooked Lake is comparatively small. 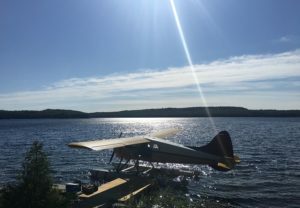 Nestled among rocky hills, it’s barely long enough to provide adequate take-off space for a small float plane, and the only other way in is by boating and portaging through a series of lakes and portages from a private dock at the southern edge of Fishog Lake on the southern boundary. 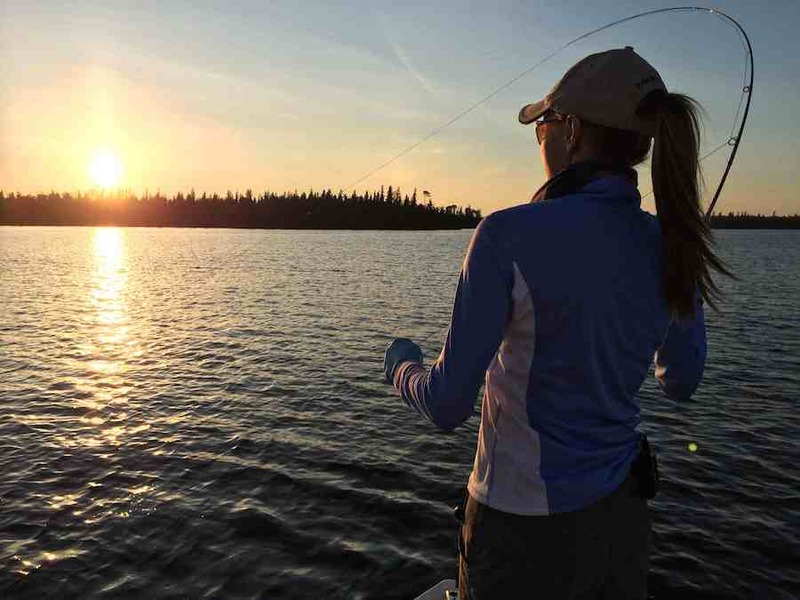 As there is only one lodge on the lake, Crooked Lake Wilderness Lodge, and it provides first-class wilderness fishing—just a couple of hours drive north of Toronto. 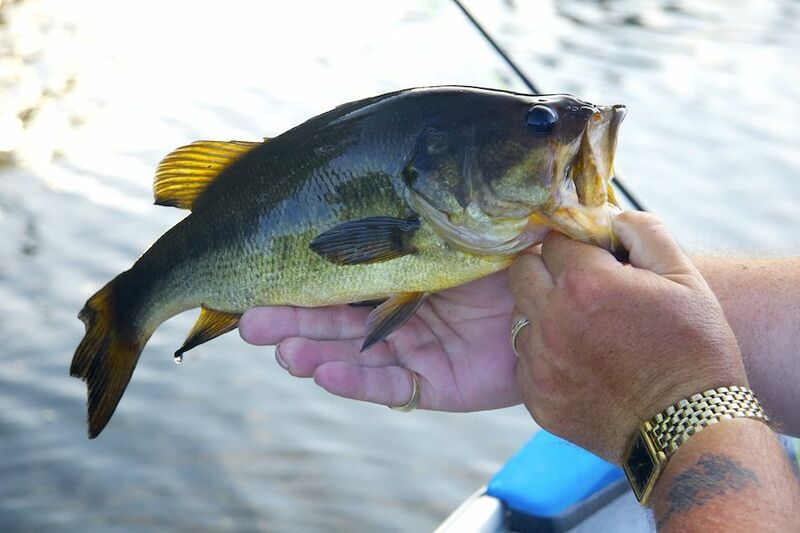 The major species in the lake are largemouth and smallmouth bass, with specimens of over four pounds being recorded every year. It’s a typical Shield lake—deep, with sheer rock faces adjacent to deep drop-offs in places, as well as shallow, weedy coves and channels. It’s a bass fly fisher’s paradise. 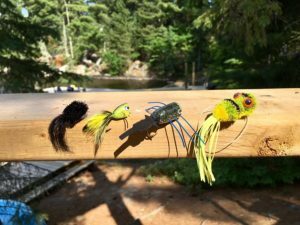 The New Fly Fisher TV crew was scheduled to shoot a show there, When host, Bill Spicer, cameraman, James Sidney and I arrived there during the second week of July, we were in the middle of a heat wave—not the best conditions. But what we’d seen of the lake from the pontoon boat which picked us from the head of the portage was very encouraging. The channel to the main part of the lake from the portage landing was rich in structure—lily pads, deadfalls, rock piles, and little bays, and we persuaded ourselves that whatever we encountered, we’d be successful. Bill even tried a few casts among a tangle of floating logs while we were preparing to cast off from the portage point. However, we decided to relax through the heat of the afternoon and wait for the shadows to lengthen before hitting the water. Mid-day siestas and intense fishing early morning and evening were pretty much the pattern for the next three days. 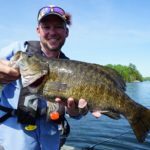 While it’s possible to tease them out from under patches of lily pads and other overhead cover, both smallmouths and largemouths tend to be less active between mid-morning and late afternoon, except on overcast days. In low light conditions, bass will feed actively close to the surface, even well out from shore where there’s no cover, but the hottest action is usually close to weed, timber, and rock cover along shorelines and shoals. Therefore, it’s best to hit the water at dawn and fish until the sun has risen high enough to shorten the shadows, then again once the shadows lengthen until it’s too dark to see. Fish out in the open water are easy. The swirls on the surface and occasional scatterings of baitfish are hard to miss. 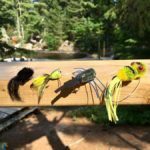 These can be targeted with surface lures, such as poppers, sliders and gurglers, or with baitfish imitations fished a foot or so beneath the surface. 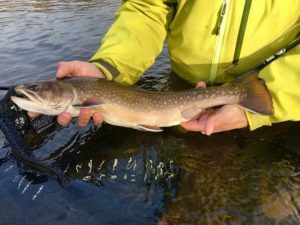 While fish will also show themselves close to cover, such places can be fished by casting to likely-looking holding spots. Weed lines, rock faces, the edges of submerged rock piles, and deadfalls without branches should be fish by working a surface or sub-surface pattern parallel to them. Patches of lily pads are more easily fished with surface or very shallow diver patterns, as it’s difficult to avoid getting the line fouled on the pad stems when fishing a sunk pattern. A popper (especially a frog imitation) cast to fall on top of a pad and then flipped off into a clear space, can be particularly effective. It’s best to leave it motionless for a few moments before giving it a twitch. Weedless patterns are essential. Deadfalls with lots of branches are prime holding spots. It’s possible to pick up fish along the edges, but there’s always more action from getting closer to the fish by casting into spaces between the branches. This can be a bit tricky, especially for the average caster, as hang-ups over twigs are virtually unavoidable. However, with a little practice gently flipping the line and by using a weedless pattern, most hang-ups can be unhung, dropping your bug into that enticing patch of water above the submerged branches. Surface patterns are preferable, as sunk patterns, even with those with weed-guards, have a tendency to hook up on submerged branches, leaving you with the option of either breaking off or disturbing the whole deadfall by moving into it to retrieve the lure. A flat calm is the optimum fishing condition, especially for fishing on the surface, as it’s possible to attract fish even with the slightest twitch of your bug. A brisk breeze and a bit of a chop on the water are also favourable. The only difference is that the bug should be retrieved more vigorously and noisily to make it more noticeable. Strong winds, on the other hand, make fishing surface patterns difficult, especially when casting among emergent vegetation, as the wind can drag the line making it foul the stems. Getting as close as possible without spooking the fish in order to cast a short line, makes things easier. Wind also makes it difficult to keep the boat on station, so that line control can be a problem. This is another reason for fishing a shorter line when it’s windy. Having an electric motor or someone to paddle makes a huge difference. There is at least one downside to fishing for a TV shoot—the constant, worry about getting enough action to make a show. Fortunately, at Crooked Lake, the worry didn’t last long. We were into fish almost immediately. At first, there were plenty of them, but nothing over a couple of pounds. We were expecting much larger specimens, as the lodge records specimens of over four pounds every season. However, as we gradually learned the lake, we began to pick up a few bigger ones—none of the four pounders, unfortunately, but big enough to satisfy us, and so many of them that we quickly lost count. I had one delightful evening when I elected to stay behind and fish from shore around the lodge. 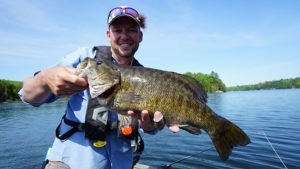 On almost every cast, I picked up smallmouths and largemouths from around the docks, as well as lily pads and deadfalls along the rocky margins. I even hooked into half a dozen good-sized bluegills. Bill, however, outdid us all on two occasions. First, by tempting a chunky largemouth, one of the “lodge fish” which patrolled the shore just beneath the dining deck, gorging on Cheerios, chunks of bread and piecrust tossed to them by the diners. He lured it with an Atlantic salmon-sized Rat-faced McDougal, which he claimed was the nearest thing to a piece of confectionary he had in his fly box. Then there was the smallmouth which erupted from the water beside a deadfall to grab his popper which had hung up and was dangling almost a foot above the surface. He landed it too. Some people have a monopoly on serendipity! The bass fishing at Crooked Lake is impressive, but what makes it unique is its apparent isolation. I’ve fished in remote wilderness lakes in both North and South America, but Crooked Lake, which is just a couple of hours from Canada’s largest city, rivals them. 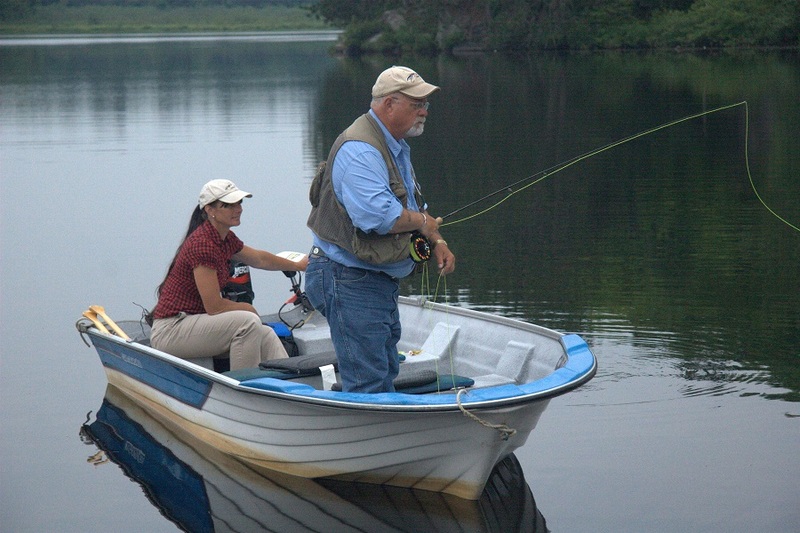 Because access is so largely restricted, the only anglers on the lake are lodge guests, and it’s so far off the beaten track, that the experience is akin to that found in Labrador or Patagonia. It’s a relative small lake, but there are so many inlets and connected channels with extensive, varied structure, that the fishing opportunities are huge. The lodge also has a fascinating history. 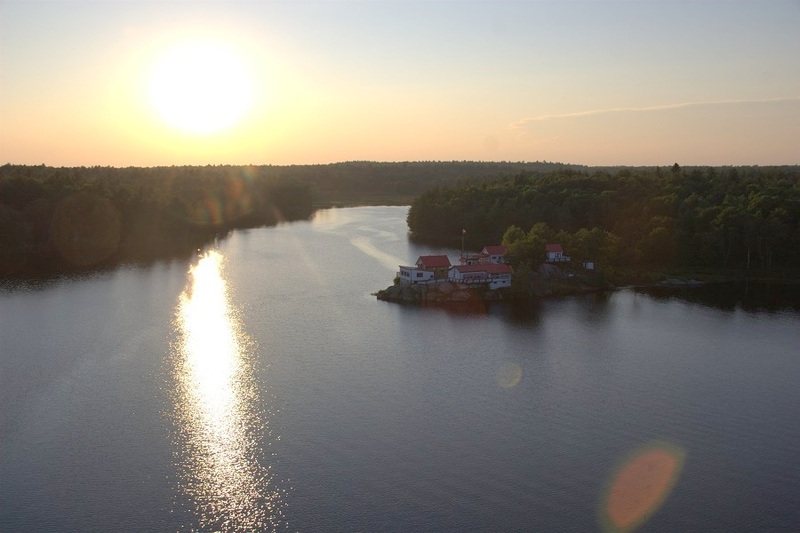 It was built as a corporate fishing and hunting retreat in the late nineteenth century. By the late twentieth century it had fallen into neglect. But around 2000, it was bought by Neil and Kerstin Kelly, who began renovating the buildings and the infrastructure. Today, the lodge, which is located on a rocky promontory jutting out into the lake, is a mixture of the old and the new. The oldest building is the Stone House, which dates back to 1917 and is now used as a bunkhouse. In addition, it has an attached lounge and bar where guests can gather after fishing or when the weather turns nasty. There are also modern, motel-style units, each with its own private bathroom. 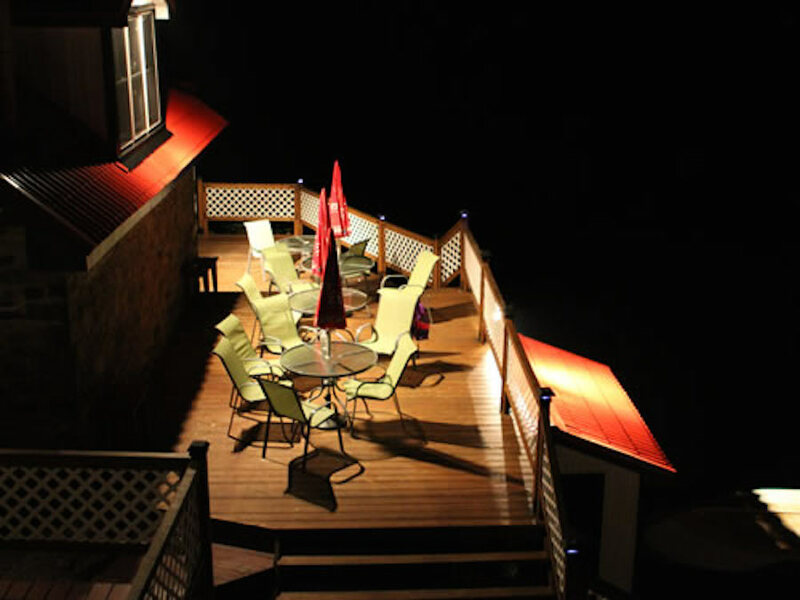 The dining room has an attached deck, which juts out over the water where semi-tame bass lurk in anticipation of scraps thrown to them by the diners. 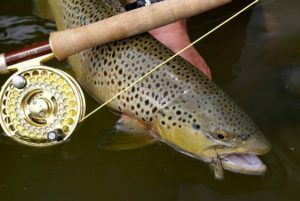 Neil and Kelly cater for fly fishers, with instruction and guiding services, and the lodge is very much a family operation.